We finished up our January mandalas for The Great Round: Stage One – The Void. We used Crayola markers and colored pencils with names like Tomato Red, Inchworm Green, Pinky Pink, Little Boy Blue, Small Potatoes, Sunwave Yellow, Green Sprout, Coral Orange, Gnarly Purple, Pipeline Green, Black Shades, Chocolate Chip, Blueberry, and Hang Ten Purple. We each chose two of the three templates to color. FIRST PAIR: The first two are the same template. What makes them appear different are our individual color choices. The patterns that emerge with color show up more when posted side by side. SECOND PAIR: The top mandala in this pair is another Stage 1 template. I was drawn to the organic shapes and bodies. The second in this pair is Stage 0 (zero) – Clear Light. 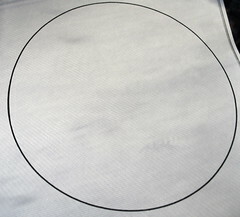 Stage 0, the empty circle, represents wholeness. It is a place to focus, to meditate, before choosing colors and templates. THIRD PAIR: The last two are the Stage 1 mandalas Liz chose, side by side. Mine are the second and third as you scroll down the page. Color, color, color. We had a lot of fun with these exercises. The weekend is nearly over. Temperatures have warmed up. Day by day, spring is on the way. That first pair is amazing in that it doesn’t even look like the same pattern. The second one has such a different look with the blacks placed in certain places. I’m havng the most fun looking at the differences and how the color combinations create them. One looks like a kaleidoscope, the other like a sunflower. Wild. QM, I’ll have to look at the others tomorrow. I had an unusual Sunday, spent from 1 – 7 at the Emergency Room with my mother. She is fine. She has started to have nose bleeds, something that she had five years ago. They are terrible and most of all cause incredible panic on her part. I’ll write about it later. I’m exhausted right now. ybonesy, so sorry about your mother. I am glad she is okay. You must be truly exhausted. You’ve had a really rough week. Hope you can get some rest. Yes, Liz and I were both amazed when we compared the same two templates that we’d each done. When you see them side by side, you can really see how it’s the color that brings out the patterns. Quite the exercise. It is meditative and calming. Again, give my best to your mother. Sending good energy. QM: Thank you for sharing the bright, beautiful mandalas. Just what I needed to warm my heart on a cold blustery winter day. 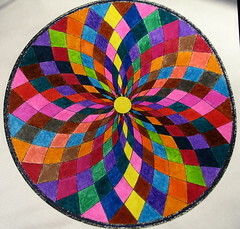 I like your wonderful plan to draw or color a mandala each month. I don’t mind not having to plan my own design. Just the coloring can be a lovely meditative exercise. These are beautiful, QM. It’s amazing how the color choices can make the same pattern look so different. QM and LIz ,Your mandalas are beautiful.I had to go copy a couple myself. Thanks everyone. We really enjoyed this exercise. It is amazing how the color choices impact the pattern. BTW, If you go to the Coloring Mandalas post (the link is at the bottom of this post) and look at the 4th photograph from the left (small squares) you can see the template for the two top mandalas in this post. It looks so generic without color! I wanted to add – to get the full context for this post, it helps to read the Coloring Mandalas post and the info about Susanne Fincher’s book on mandalas. And as I mentioned in the Comments on that post, she offers two mandala templates that you can download and print out, all for free, if anyone wants to try it. 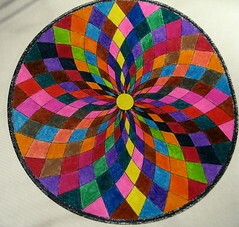 There is also more about creating your own mandala. We are living with the four we colored over the weekend for a while. When you have completed your mandala, write the day’s date on it, then put it somewhere in your living space where you can walk by and see it often. Let it be part of your life for a few days. Be open to receive any messages it has for you. 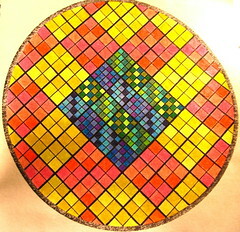 QM, in your Coloring Mandalas post, you made the comment that Liz is detail-oriented in her drawing while you are not. Given that comment, I would attribute out of the first mandala pair the second one to her. Let me know if that was a correct guess or not. The last one also had an amazing amount of detail in the color. It took me a while before I noticed the alternating lighter shades of color within the color box areas, which made the pattern seem to have a pulse to it. Beautiful…and so much movement going on in them! QM and Liz, the mandalas are just gorgeous. I like what you say about meditation, QM. 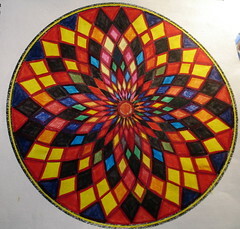 I began teaching my daughter to meditate by coloring mandalas (i.e. at five the closest we could get was “when you are coloring pink, pink is all that exists”). It brought us much peace. It’s really amazing how different the same pattern looks when colored differently. I truly thought they were two different patterns! ybonsey–sorry about your mom–the nosebleeds are scary! I hope she feels better soon! Thanks, Melissa. Yes, they are scary, especially when they won’t quit. I appreciate your comment. Hey, what a great idea for helping a young child slow down and meditate! When I saw the mandala coloring kits, I flashed on the notion that it would be a fun thing to do with my girls. Jim would like it, too, I think. Melissa, great to hear from you. Cool that you used to use mandalas to teach your daughter meditation. I think kids would love doing this. It’s very soothing. ybonesy, the last mandala on the post with the shades of light and dark is Liz’s. In fact, the last two are the ones that Liz colored. I agree, the detail in that last one, she had a lot of patience with it. That one would have driven me crazy! Of the first pair on the post, hers is the first, mine is the second. Funny, but I saw the first as having more detail! When she was younger, Liz used to color envelopes on her letters in all these very detailed patterns and colors. I had another friend who did that, too, as a teenager. It never would have occurred to me. And the detail on those letters! They were works of art. I can not help but imagine that weekends at your house, no matter what you happen to be doing that week, are always a lot of fun. amuirin, I think you might be right. 8) I can’t imagine even one day without having some kind of fun. Liz brings much joy to my life. BTW, she’s an Aquarius, the eleventh sign of the zodiac, all the way. I imagine it was zen like creating these. I’m not even sure which one is my favorite for they are all beautiful! Thanks gypsy-heart. I’m kind of already looking forward to February’s. diddy, thanks for the birthday wishes. Mom sent an e-card, too. And Liz’s Mom called. She also got lots of well wishes from others all day. Do you know there are two other people where she works with the same birthday? We are winding down. But I wanted to add that Liz’s Mom reminded her that she won a coloring contest when she was a kid. 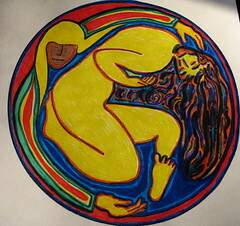 I can’t remember the details, but from the looks of her mandalas, she’s still got what it takes! Night all! QM, Brant is here today & when I showed him the mandalas that you & Liz did, he was eager to give it a try. We used the 2nd one that was downloaded from the link as it seemed better suited to a 1st grader! He did 3 of them himself. 2 with crayons & one with gel pens (the gel pens were tricky) He signed his name to all 3 & I promised him that I would let you know how much he enjoyed this practice! We will be doing more in the future for sure! Hope you & Liz are staying cozy & warm in the frigid weather there! diddy, that’s so cool about Brant’s mandalas! (Liz and I were just talking about starting our February mandalas tonight.) I love that he signed them, too. It’s good to start signing your artwork! I’ll have to see them when I’m there next time. Did you all hang them up? I guess part of the practice is to hang them up and live with them for a while, to see what they are trying to tell you. I hung our last four over the bed. I love seeing them every morning. BTW, did you color one, too? diddy, I can picture it, Brant humming along while he was coloring his mandalas. And you coloring yours beside him. It’s a great image. I’m glad he wanted to take them home. It’s hard to describe the things that kids (and adults) get from ART – doing art, making art, learning about art, getting out into the world and seeing what other artists have done. Art seems to be the first thing (along with exercise) that is cut out of school programs. And I can never understand that. The artists of any time are a reflection of the conscience of that time period. And many are on the cutting edge of blazing a trail forward. Or reviving the art and artists of the past. I feel the same way about writers. That’s why I am glad that ybonesy and I talk about writing and art. They are both so VITAL to a healthy country, a healthy world. Thanks for sharing your process with Brant and his mandalas! Liz and I started our February ones last night. We each did different patterns, very different. Once again, it was centering. But we were up very late. I’m getting a late start this morning! More to come on those when it gets closer to February’s end. Thank you for your creativity and especially for Mandalas from Big Circle, that you are created! I live in Russia and that illustrations very helpfull for me, because I have no possibility to look it from some another sourses. I’m young psyhologist (just a student yet) and try to learn much about methods of art-therapy, especially about Mandala metods. Vadim, thanks so much for your interest in the mandalas I posted on red Ravine as part of my personal practice last year. The reason you don’t see Stages 9-12, BTW, is that I haven’t posted them yet! I did complete a year of personal mandala work following The Great Round in Susanne F. Fincher’s book and her recommendations for working with archetypal mandalas. And I do plan to get them posted over the early part of this year (I’m definitely the Turtle, not the Hare! And wish I were more of an Ox like yb!). Working with the mandala archetypes was transformative and sticking with it over a whole year changed me in ways I’m sure I don’t yet understand. I’m continuing to work with them in the studio, painting and drawing, though at a much slower pace. However, I want to make clear that I’m not an art therapist, though there are many books out there about working with mandalas in art therapy. I borrowed a few books off of Liz’s shelf when I began the practice in January of last year. I’m not clear from your comment, but do you have access to other Internet sites? If so, I’d recommend heading to the couple of sites I provide the links to below. I can also add their contact information in this comment, so that maybe you can write to each of them for more material on the art therapy aspect of mandalas. As far as making it more clear what the different stages of The Great Round are, maybe I’ll do a wrap-up post when I complete the posting of the December 2008 mandalas, and do a synopsis of the stages from The Great Round that are talked about in Suzanne’s book, and derive from the great work of Jungian, Joan Kellogg. I did like using that structure over the course of a year. It was helpful to have it to follow. Liz (who has a degree in psychology and is very interested in art therapy) bought another mandala book by Judith Cornell called The Mandala Healing Kit: Using Sacred Symbols For Spiritual & Emotional Healing. She pulled it out during Winter Solstice this year when we were making our bundles to let go of in the fire. I’m not as familiar with that book (also comes with a CD), but hope to take a look at it as I continue to work with the circles over 2009. Suzanne Fincher also has, I think, at least two other mandala books in her series with great templates. So here are the links and info. I hope it helps with the art therapy and good luck with the teaching! Link to her site: Judith Cornell’s Official Website (LINK) Note: At the bottom of her webpage, there is a video of an interview of a global broadcast she did translated in 10 languages simultaneously, including English. Looks like she also offers Webinars. Vadim, yes, I bet it is hard to find some of these books in digital format. Maybe someday though; don’t give up! I’m glad you find these mandala posts helpful. Thanks for stopping by again, all the way from Russia! Really detailed answer, QM. I’m so glad Vadim came back to check it. But I also wanted to say I was struck by the contrast between the ancient mandala icongraphy and the idea of a digital format for accessing information about mandalas. Seems like a good project for someone out there.